Printed from http://www.bodytalksystem.com//learn/news/article.cfm?id=941 on Apr 22, 2019. This past week, it was a great privilege to take part in the first Westman Wellness Show held in Brandon MB, which was a great success! I would like to send a big congratulations to Robin Chant, a fellow BodyTalk Instructor, who was one of the two women who organized this event. I was lucky to have a booth with two local practitioners, Elaine & Louise Sanders; these women rocked the show! At the start of the day, they claimed to feel nervous and hesitant; by the end of the day these two ladies were simply shining as they spread the word of BodyTalk. 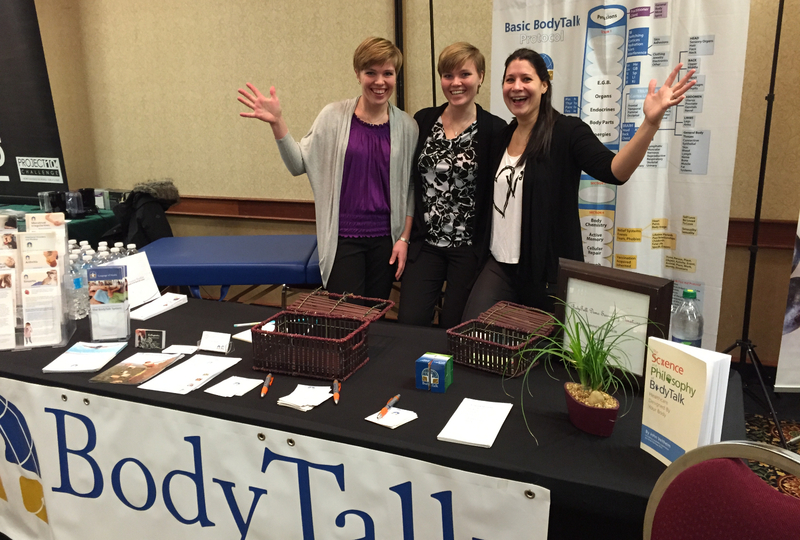 I was honored to be asked to do a presentation about BodyTalk at the Expo. We had a full house for the presentation, and I loved seeing the room filled with people tapping their cortices! Connecting with local Practitioners at Expos is always a lot of fun and is a great way for us to hear and share the wisdom that is within! Thank you ladies for a great day, and the IBA for such supportive marketing tools that give us a level of professionalism ensuring these events are a success!